I have been practicing yoga and teaching elementary school for about 17 years. From full time to part time, I have always included yoga in my classroom, even though I am not a trained yoga instructor. I lead the children through asanas before PE, as well as sometimes teach a longer class as part of PE. When I taught full time, we started each morning with the sun salutation, although I called it our good morning stretch. Over the years, I learn a little bit more about how to make our yoga time more successful in the classroom. This is my latest discovery for teaching yoga to kids! We recently received a generous donation of mats from Yoga Direct. Yesterday was our first day with our mats. 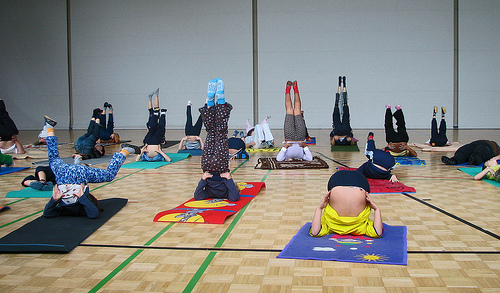 The children were so excited and took their asanas more seriously just because they had a mat. It also helped define their space and limit the wiggles. Often the yoga classes I take end with a chance to do one final pose that would feel good to your body before Savasana. I noticed when we laid down our mats yesterday, the children really wanted to explore their own bodies and asanas. Providing time both at the beginning and end of our time gives children some self-expression and ownership of their practice. Before we had mats, I had never practiced Savasana, or corpse pose, with children. Lying in the itchy grass outside or the 50-year-old school carpeting was not inviting. I also assumed they could not lie still and silently. Boy was I pleasantly surprised when the second and third graders seemed to relish in this pose. Savasana is very grounding, and children today especially need this time to be still. Kids love to talk; they love to share. They want you to know where they are feeling the stretch. They want to show you what they can and can not do. It used to frustrate me to no end! Then I realized that I should expect silence from the children when we are practicing and allow for discussion at the end. It is better for me and better for them. Kids are kids, and they love to play. To expect them to just follow asanas without it being playful is not developmentally appropriate, depending on the duration. The animal names of many poses lends itself easily to connect to literacy where children act out the parts of books by completing the poses. If you have a small group of children, cooperative games, such as [amazon_link id=”B000I1NBZM” target=”_blank” ]The Yoga Garden Game[/amazon_link], are really fun. Yoga should be playful for adults too!